I stumbled across Stonebridge Golf Links while searching for new places to play twilight rounds after work. I knew nothing about it except that I could get to the first tee from the seat in my office in about 20 minutes, and that a Long Island golf map listed it as one of the area's “can’t miss” courses. So late in the spring of '08, I took the ride out to Smithtown and gave it a shot – and I’m glad I did. Over time Stonebridge has become one of my preferred spots for a quick and pleasant 18. 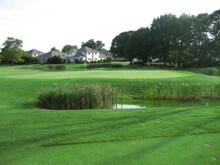 Formerly the Hauppauge Country Club, Stonebridge Golf Links is a semi-private par-70 (members-only on weekends) that weaves its way around a residential golf community. Many of its holes were redesigned and restored as architectural shout-outs to the classic designs of Seth Raynor, C.B. Macdonald and Charles Banks. Holes like "Redan" (#4) and "Biarritz" (#7) are styled after layouts found farther east at the famed National Golf Links and other courses a bit farther east across the pond in Europe. Houses are often close enough to make you feel a little claustrophobic and impact how shots are played, but overall, they do not play nearly as much of a role as do the large, often severely sloped or tiered greens, or the water hazards that make appearances on half the holes. The course is not long (6,200+ from the back), but it is a little tight in spots. Stonebridge's lack of yardage is countered by its steep demands in terms of pin placement and approach angles. You’ll understand when you're pitching or putting from the wrong side of a green. 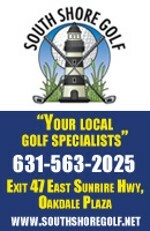 Despite its name, don't head to Stonebridge expecting links golf. The closest thing to links that you might find will be cooking on a grill on one of the patios along the 10th or 16th fairways. If you're in search of something close to a traditional links layout, you'll have to look elsewhere. It is a tightly packed course, forming a rectangular perimeter around the development, with holes running side by side in close proximity to one another. Pockets of trees influence play on some holes and small ponds and streams cloud your judgment on others. Start your day with a downhill par-4 that eases you into your round. You'll appreciate the soft start when you step up to the second tee. Hole #2, the 432-yard "Alps," gradually works its way uphill toward a slope that protects the approach to the green. But the tee shot on #2 can be intimidating. Two ponds sit in front of the tee, and while they won't come into play as long as you put your drive in the air, they do serve as somewhat of a deterrent. There is a thin line of trees on the right that can disrupt your second shot, and on the left, out of bounds is not too far from the edge of the fairway. All those factors combine to create a view from the tee (right) that is super narrow with trouble every which way. There are three par-3s on the front, beginning with #4, "Redan," where the pin is guarded in the front by a bunker and small stream. Like on all redan holes (reverse redan, in this case), the entrance to the front of the green is tilted so that balls will flow quickly toward the back right edge. The seventh hole -- "Biarritz" -- measures 194 yards and falls off into strips of bunkering on all sides. Its most notable feature is the gully that crosscuts the two sections of the elevated putting surface. Sand makes its most significant appearance on #9, aptly named "Sahara," where a series of bunkers await anyone who plays the short and simple downhill shot with too much finesse. Knowing your way around a tricky green becomes vital after the turn. The par-5 11th plays straight out and wide open, but a raised spine running from front to back through the center of the green can turn an unfortunately located birdie opportunity into a string of muttered expletives. The double-tiered green on #14, elevated atop a mound, is followed by the shorter-than-it-appears 15th ("Short," formally) that features a green with a big bowl cutout in the center. "Hog's Back" at #16 is severe enough that a playing partner and Stonebridge veteran once stopped me in mid-practice stroke to tell me my line wasn't even close to correct. "Course knowledge," he put it. Water makes an appearance on about half the holes, but it is a major factor on #10, where the fairway curls around a pond and coaxes players to forgo a safer shot to the right in favor of the shortcut over the water. The greens at Stonebridge require frequent visits before you begin to get the hang of them. From the tee or fairway, newcomers will take note of the flag color and adjust accordingly. But experienced players know better, well aware of where to attack and where to miss. Reading the greens isn't as frustrating as keeping your ball in the proper spots. Some feature spines and ridges, others are steeply tiered or canted. Many of the greens at Stonebridge are designed with the characteristics of classic courses -- specifically the works of architects Seth Raynor, C.B. Macdonald and Charles Banks -- in mind. With such distinct features on and around the greens, all holes take on a completely different identity -- and require an adjusted strategy and approach -- with each change in tee and pin placement. This gives the course an added dimension of playability, and makes it so that Stonebridge players must always be on their toes. The houses, mainly on #2, #10, #14 and #16, might have no impact on some players, but for others, they may be an annoyance and a turn-off. In some spots, a ball can be sitting in plain view no more than a few paces from the fairway, but will be considered out of bounds on private property. On the third tee, one can theoretically split the fairway with their 3-wood and high-five the neighbors on their patio, all in one motion, before heading up toward the ball. Quirkiness plays a big part at Stonebridge, so much so that one worker I spoke to my first time around was downright giddy about it. "So what'd you think of #6 and #14?" he asked excitedly. "Fun holes, right?" Both are short par-4s (269 and 290 from the whites, respectively). You can drive the green from the elevated sixth tee, but the "Principal's Nose" -- a grassy bulge in the far end of the fairway, with a hump surrounded by three small bunkers -- threatens anything short and center. Get overzealous and pull-happy and you might find yourself in someone's pool. Bail out to the right side and you leave yourself an approach to a green running hard to the left. The 14th almost seems too short and simple to be true, but the two-tiered, elevated green can quickly cause fits of rage if you loft a shot onto the wrong level or stick your approach into its rough-riddled face. I also enjoy #3, a 322-yard par-4 with a green (right) surrounded on three sides by water and rolling mounds protecting the front, and #8, by far the longest hole at Stonebridge (555 from the whites). Ponds sit in hiding beyond the fairway on your tee shot and off to the left on the second shot, and a deep bunker guards the left side of an elevated green. Until you've played Stonebridge a few times, it's impossible to know exactly where and where not to be. But as a quick guide, try to keep yourself on the pin-side of the 11th, 15th and 16th greens, and know the pin location on #14 before pitching up to the green. Also, the boomerang-shaped green at #12 is wide enough for the fringe and rough to cut off a badly placed shot on one end of the green from the cup on the other end. If you've never been to Stonebridge before, look for the sign out front for ZZ's Grille, Stonebridge's restaurant. It's easy to miss the course entrance, and the fewer U-turns and quick merges you have to make on the busy 347/454 corridor, the better. Have thoughts and opinions on Stonebridge? 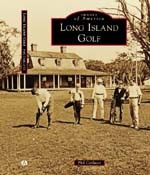 Share them with other Golf On Long Island readers by posting in the comments section below.